In the highly saturated market of dating apps, one startup aims to differentiate itself. Meddle is a new, free dating app that allows singles seeking relationships to have trusted friends help find someone for them. 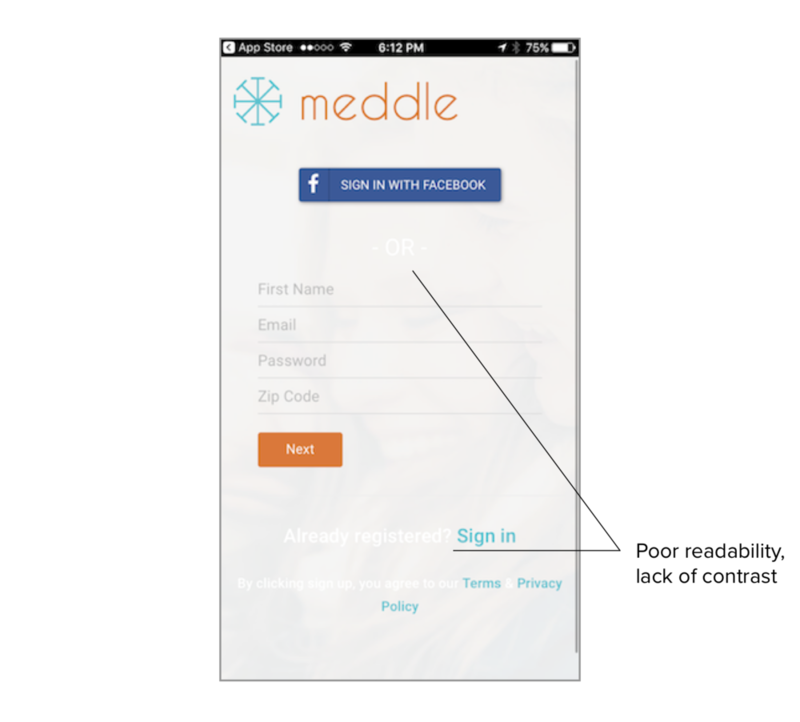 In a capstone project for a UX Design Immersive course at General Assembly, I worked with a team to streamline and optimize Meddle's app for iOS. The focus of our scope: onboarding tutorial and profile creation. Our team was provided with a one-page design prompt to help Meddle develop an onboarding process and optimize it for signups. 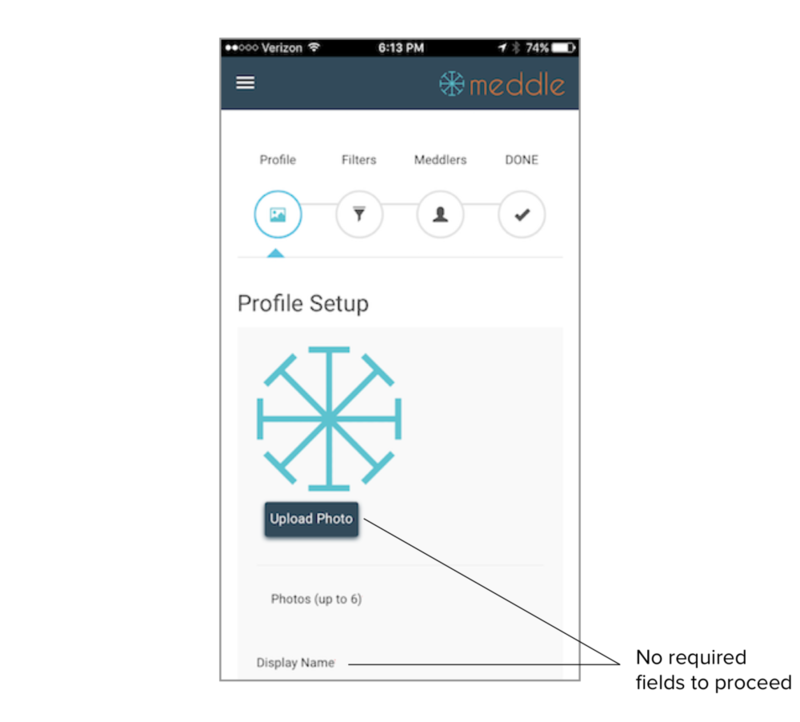 As quality profiles are critical to the success of any dating app, our team also reviewed Meddle's current profile creation process. To get an idea of what we were working with, I went through the process of creating an account and inviting Meddlers. After discussing Meddle's matchmaking process with our stakeholder, it became clear that we would need to understand two separate user types: singles who are seeking relationships, and their friends, the Meddlers. In order to do this, we sent out two separate screener surveys, one asking about dating/online dating habits, the other targeting people who actively set up their friends in real life. For the latter survey, we omitted any references to online dating as to best understand the behaviors and motivations behind matchmaking for your friends in real life. From the 114 survey responses, we interviewed 15 people with the aim of learning more about their dating habits. Again, for the purpose of keeping both user archetypes in mind, we kept single online daters separate from the matchmakers. While Meddle has an interesting differentiator, there are many competitors in the realm of dating apps. Using the information we gained from our screener survey, we determined that the biggest competitors were Bumble, Tinder, OkCupid, and Hinge. In our analysis, my primary focus was on the way these platforms onboard new users, and usability conventions such as the ability to swipe (not currently a capability on Meddle) and how user move through a profile. Dating apps are used as a group activity for some. Many seekers will let their friends take their phones and swipe for them, or have their friends help them create their profiles. Create a comprehensive, yet simple tutorial to educate both Seekers and Meddlers on how matches are made and to optimize the creation of thoughtful/ complete profiles throughout the signup process. There are multiple factors that go into creating a match on Meddle. Our challenge was to create an onboarding tutorial that would educate users and enable them to easily use Meddle, without overburdening them with extraneous details. Our first step was to break the process into four steps and create simple, clear copy. After a round of sketching, we user tested sketches to see if our users were able to understand the key points. For the second round of testing, users were shown only the graphics for each step and asked to explain what they though was occurring. This strategy was used to ensure that supporting images were correctly conveying the action described by corresponding text. After multiple iterations, we decided to create animations for the first two steps to help users visualize the process. The slideshow to your right is the last iteration of the tutorial design.